Well, I didn't see this one coming. I thought the city block sized ConEd plant would outlive us all, but I guess nothing in life is guaranteed. I got this email today about the ConEd Plant between 58th and 59th being demolished. Referred to as the "IRT Powerhouse", I feel like there should have been more noise about this. Do we think it is the entire block or part of the plant? 8-10 weeks for demolition seems like a short amount of time for such a large structure. We have received notice that permits have been obtained to begin demolition activities during the coming weeks. The demolition will be conducted in phases beginning with a soft demo to prepare the site for more extensive demolition in the future. Demolition is expected to be completed in 8-10 weeks, depending on the weather conditions. Soft demolition will begin which will include: Debris carting to/from the site via trucks and container Use of mini evacuators, chopping guns, power tools and generators Over the course of construction, we will do everything we can to mitigate the impact on the residents of The Helena. I thought that was landmarked. It's a beautiful building but for the modern, west wing. ps: I hate the new version of google maps! That would make sense. The addition is as ugly as the main structure is stunning. To lose the main building would be quite sad. 600 West 58th is the Mini Storage building across the street on the SW corner of Eleventh. The DEMO Permit was issued for that building on 2/18/14. A NEW BUILDING Application for an 11-story Mixed Use structure with 120 dwelling units was Filed on 1/17/2014. Zoning is Pending. The development project will also include a conversion of a Manhattan Mini Storage building at 600 West 58th Street to community facility, residential, or retail uses. I hope you're right, L1. An expert, sympathetic adaptive reuse plan would give that part of Manhattan something to be proud of. Keeping the chimneys too would be awesome. “The building, a marriage of convenience, a modern metal shed with the face of an aging actress, the utilitarian made beautiful, is our city’s Temple of Power.”� - Mosette Broderick, professor at New York University, author of Triumvirate: McKim, Mead & White: Art, Architecture, Scandal, and Class in America’s Gilded Age. “Since 1999, Seven to Save has mobilized community leaders and decision-makers to take action when historic resources are threatened,”� said Jay DiLorenzo, President of the Preservation League. The former IRT Powerhouse was designed by Stanford White of McKim, Mead & White, New York’s first “starchitect”� and designer of the city’s most significant Gilded Era facades, among them the Astor, Vanderbilt, and Tiffany mansions, the Century and Metropolitan Clubs and the original Pennsylvania Station. The IRT Powerhouse was constructed in 1904 to provide electricity for New York’s first subway system. The Hudson River Powerhouse Group, a non-profit group championing the effort to see the structure landmarked, has called the Powerhouse “an architectural treasure”� and “the physical embodiment of”¦pride in one of the world’s greatest subway systems.”� It powered the city’s subways for more than 50 years. In 1959, the subway system required less electricity to run effectively so the Powerhouse was sold to Consolidated Edison and became a steam-generating plant. Landmark West! is an award-winning non-profit that works to achieve landmark status for individual buildings and historic districts on the Upper West Side of Manhattan. According to details provided on The Hudson River Powerhouse web site, Consolidated Edison has contributed to the deterioration of the IRT Powerhouse: the company has “cut holes in the exterior walls, demolished the cornice and smokestacks, and punched out windows.”� If the structure were to be designated a landmark Consolidated Edison would be required to maintain and preserve the IRT Powerhouse, without altering the faÃ§ade and structure of the building, “for generations to come.”� The investor-owned company would also be expected to reduce its existing footprint substantially within the building and/or move its operations to a more sustainable location. 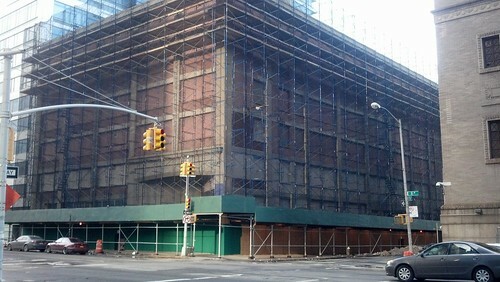 The effort to landmark the former IRT Powerhouse has been in process since 1979 when the first public hearing in the case was held at the Landmarks Preservation Commission. Since then Consolidated Edison has countered that landmark designation would make it more difficult and expensive for the company to operate and modify the station. “That would mean additional costs for steam customers and jeopardize the reliability of our steam system,”� said the Consolidated Edison spokesperson. The company lists the Empire State Building, Grand Central Station, the United Nations, hospitals and schools among its customers. While the future of the former IRT Powerhouse is unsure its potential is certain. The building’s grand scale, pivotal location and glorious architecture have already captured the imagination of developers and investors. Graydon Carter, editor of Vanity Fair, envisions a photography museum in the building. Robert Quinlan of the Quinlan Development Group, dreams of re-adapting the building’s enormous interiors into “a vintage auto museum with rotating exhibits and complimentary uses ensuring a constant flow of local and foreign visitors…”� Others have suggested the space be used for performances, public events, general recreation and the exhibition of treasures currently warehoused in existing museums. Yep, looks like a false alarm. According to New York YIMBY, 600 W 58th is actually the Mini Storage building across the street, which makes sense considering the demolition permit described it as a "6 story concrete building". Wow Czervick that was a cruel joke. I nearly had a heart attack when I saw the thread title. Let's pray to god lofter and ajs0503 are right and it's indeed a false alarm. Hey guys, I think I overreacted and didn't do enough homework. I forgot that even numbers are on the south side of the street, so 600 West 58th is the small, former Manhattan Mini-Storage facility. Sorry for the heart attacks, I am a dummy. No probs Czervik. You meant no harm. We all make those same mistakes. You do a good job keeping an eye out for us in that area of Manhattan. Anyway, I bet that Mini Storage building was good looking at one point and had its facade stripped. Not happening now, but there's an interesting tidbit in the like thread about who actually owns the land/building. It may be the MTA. If that's the case, as a state agency, they may very well not be bound by city landmarking. If they wanted to raise money and sell it to a developer, they could demo it, and sell the raw land. It has such a large footprint that this is the kind of place a really interesting tower could be set inside the building while preserving the facade the whole way around. That's a plan I would not be opposed to seeing. I heard anecdotally a few times, from unreliable sources that the cost of dismantling the IRT plant is so massive that developers have shied away from making a serious bid, especially when there is a giant open pit next door big enough for 5 buildings at Riverside South.